Seeker of sunshine, lazy days at the beach, and exquisite food, Teresa of Florida Girl Cooks is a native Florida blogger. 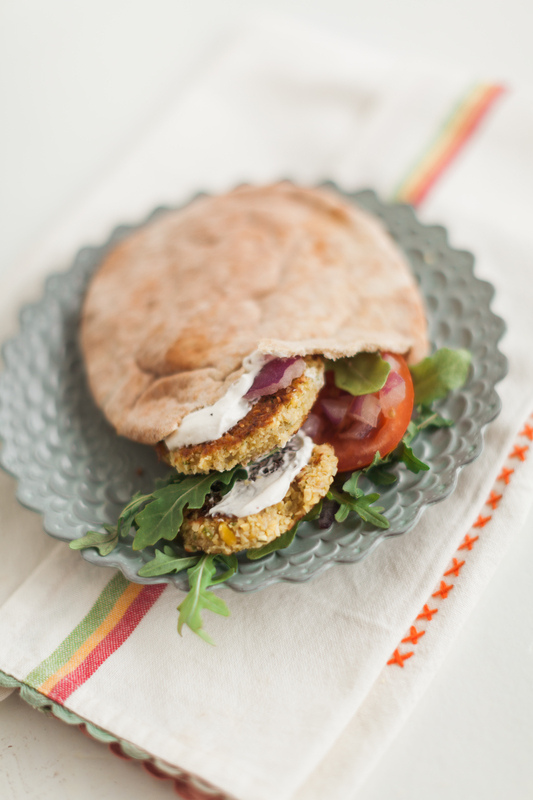 These falafel pita sliders are everything healthy and delicious and you’ll want to add it to your weekly meal prep. In my quest to eat cleaner I’ve been searching for some wholesome recipes, such as this one, that are both delicious and healthy. Eating healthy doesn’t mean eating leafy greens without much other substance all day. The ever prevalent healthy source of good food should be coming from fiber. This is something very much absent in American fast food. Subsequently, they sell you up on the idea that you’re getting protein, which it’s legitimacy and wholesomeness are obviously questionable. Obviously, these foods lack the single-most thing that keeps our digestive system clean and functioning to it’s highest efficiency. In an effort to help promote healthier eating I am sharing this recipe that you are sure to love! Enjoy! 1. To prepare falafel, combine 6 cups water and chickpeas in a large bowl; let stand at room temperature 8 hours or overnight. Drain. 3. Combine chickpeas, onion, and next 9 ingredients (through ground red pepper) in a food processor; pulse until coarsely chopped. Divide and shape mixture into 16 (1/2-inch-thick) patties (about 1/3 cup per patty). 4. Heat a large cast-iron skillet over medium-high. Coat pan with cooking spray. Place 8 patties in pan; coat patties with cooking spray. Cook 2 to 3 minutes on each side or until browned. Place on a wire rack set on a baking sheet. Repeat procedure with cooking spray and remaining patties. Place baking sheet in oven; bake at 450°F for 10 minutes. Reserve 8 falafel patties for Falafel Pizza and Falafel, Feta, and Tomato Salad. To prepare falafel, combine 6 cups water and chickpeas in a large bowl; let stand at room temperature 8 hours or overnight. Drain. Combine chickpeas, onion, and next 9 ingredients (through ground red pepper) in a food processor; pulse until coarsely chopped. Divide and shape mixture into 16 (1/2-inch-thick) patties (about 1/3 cup per patty). Heat a large cast-iron skillet over medium-high. Coat pan with cooking spray. Place 8 patties in pan; coat patties with cooking spray. Cook 2 to 3 minutes on each side or until browned. Place on a wire rack set on a baking sheet. Repeat procedure with cooking spray and remaining patties. Place baking sheet in oven; bake at 450°F for 10 minutes. Reserve 8 falafel patties for Falafel Pizza and Falafel, Feta, and Tomato Salad. Teresa is a South Florida native who is a photographer that also has a passion for food. She's a seeker of sunshine, lazy days at the beach, and exquisite food.